William Lathrop met Henry Snell in the early 1880s in New York, when both were unknown young artists who eked out a living working for a company that made mass-produced etchings. Snell was from England, Lathrop from Ohio, and in the next several years they each visited the other’s stomping grounds. Lathrop took Snell on a sailing trip on Lake Erie, and Snell traveled with Lathrop in England, where Lathrop met his future wife, Annie. While Lathrop’s life took a more circuitous route to success (he spent many miserable years in his thirties on the family farm in Ohio), Snell became a very successful artist and arts leader in New York, for a time even leading one of the influential New York watercolor societies in the 1890s. When Lathrop moved to Bucks County, his friend Snell began to visit. Eventually he too moved to New Hope and became a beloved teacher in Philadelphia at the school that’s now known as the Moore College of Art. 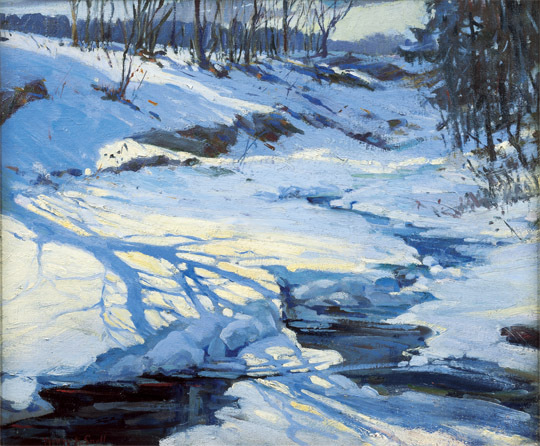 Henry B. Snell (1858-1943), Shadow on the Snow, n.d., oil on canvas, H. 20 x W. 24 inches. Collection of Marguerite and Gerry Lenfest.